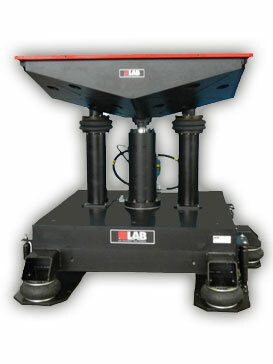 Hydraulic Vibration Test Systems for package and product reliability testing. For performance testing of products and shipping containers. L.A.B.’s Hydraulic Vibration Test Systems help you design high quality, cost-effective products and shipping containers by accurately measuring sensitivity to sine or random vibrations. Field-Test Systems are specifically designed to meet a wide range of ASTM, DOT, ISTA, 3A, ISO and federal standards for vibration testing. Our hydraulic vibration test systems are ideal for a wide spectrum of testing applications ranging from sine sweep tests to the most complex data real time simulation, or random reproduction applications. Set allows easy specimen attachment to the vibration table. Maintain shipping container alignment during testing.